Stage IV non-small cell lung cancer; drawing shows other parts of the body where lung cancer may spread, including the other lung, brain, lymph nodes, adrenal gland, kidney, liver, and bone. An inset shows cancer cells spreading from the lung, through the blood and lymph system, to another part of the body where metastatic cancer has formed. Stage IV non-small cell lung cancer. The cancer has spread to the other lung, and/or to lymph nodes, fluid around the lungs or heart, and/or other parts of the body, such as the brain, liver, adrenal gland, kidney, or bone. 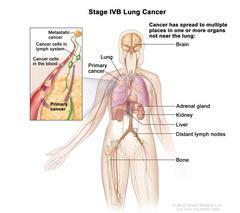 Stage IV non-small cell lung cancer.